While the music biopic is a genre I clearly gravitate to, I imagine that it can be difficult for the people writing these types of movies to get everything historically perfect and still make a memorable film. In the case of Bohemian Rhapsody, the acting and singing is so fantastic that those small inaccuracies don’t really matter. In fact, the people in this movie are so spot-on I forgot I wasn’t watching actual members of the band. Also, some of the dialogue is so cleverly snappy it’s hard not to mention here. But this review is a spoiler-free zone so I will restrain myself. 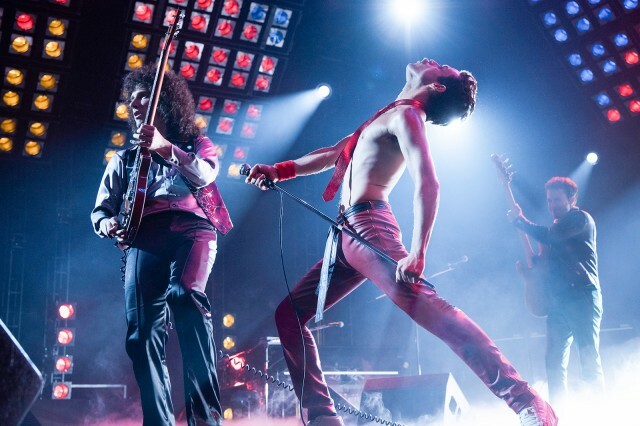 Though I knew a little bit about Mercury’s backstory before seeing the movie, Bohemian Rhapsody delves deeper into what made the epic frontman tick. For example, I knew Mary Austin was his first spouse (until he came out to her) and remained his best friend and the person who inherited much of his estate. Their friendship endured until his death and I love that. What I didn’t know was how tight Queen was as a band. For some reason I assumed that Mercury was the crazy genius that had to talk the other members into doing six-minute songs with both rock and operatic qualities. Nope. Every member of that band shared the same innovative vision and contributed a wide array of ground-breaking ideas, song lyrics, melodies, and thoughts on how to set their sound apart from everyone else. Because a significant component of Mercury’s legacy is his sexual orientation and tragic death from complications from AIDS, I also assumed it would be a more prominent aspect of the film. It was, to a degree, but the film’s PG-13 rating clearly restricted depicting some of the notoriously hedonistic parts of Mercury’s life. But that’s fine because in the movie it is specifically stated that he didn’t want to be a cautionary tale or poster boy for AIDS and the plot adheres to that. I think that keeping it about the music is what Mercury would have wanted and that’s exactly what’s achieved in Bohemian Rhapsody. Fun anecdote: Mike Myers, who is completely unrecognizable as EMI record label executive Ray Foster, is in a movie called Bohemian Rhapsody 26 years after singing along to the song in Wayne’s World. (Apparently, the studio wanted a Gun N Roses song for that scene but Myers lobbied for “Bohemian Rhapsody”). Having the song in Wayne’s World put Queen back on the minds of music fans and back on the charts – it hit number two on the Billboard Hot 100 chart 17 years following its initial release. Spot on review! Rami Malek was unbelievable. I did wish for more of a journey through how the band became so close and, in unison, developed their sound – that part was rushed. Regardless, I felt like I was at a live concert for most of the film and had so much fun watching it. I also felt like it was a live concert plus “Behind the Music” information that I love! Will definitely be playing some Queen on Bite the Bullet this week!